Scott Easterlow still believes Racing Club Warwick will have something to celebrate come the end of the season. 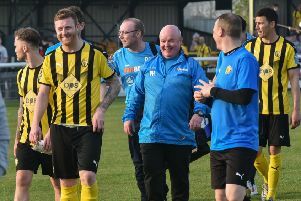 Racing Club Warwick boss Scott Easterlow is refusing to write off his side’s title chances despite it looking increasingly likely he will fail in his aim of a top-five spot at Christmas. Following the postponement of last Saturday’s trip to Heather St John’s, Racers lie seventh in Midland League Division One, 15 points behind leaders Leicester Road, albeit having played five games fewer. However, it is Walsall Wood in fifth place who Easterlow sees as their main rivals for the solitary promotion slot. “We still have some big games to come but at least that means our fate is in our own hands,” said Easterlow. “The early leaders Walsall Wood have dropped points over last the few weeks and have lost the same number games as us now. “If we win our game in hand we’re four points behind them with them still to play so you have to say we’re in it, as are seven or eight teams. “Normally one side runs away with it but this season looks as though it might go right to the wire with everyone beating everyone. “There’s a long way to go but if we can finish this year off with all nine points then we’ll try and kick on in the new year. Racers face a tough test on Saturday when they travel to fourth-placed Hinckley AFC.